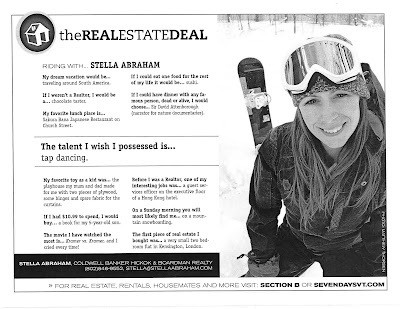 I was recently unpacking my "office" boxes and I came across "the real estate deal" survey that was published when I first joined Hickok and Boardman in 2008 for Seven Days in Vermont. It is funny how life changes and here I am back in the Bay Area.......I thought it would be a bit of a giggle filling it out again! My Another dream vacation would be......travelling around South America to travel to an island - a remote one! The A more useful talent I wish I possessed is......tap dancing the ability to be in more than one place at a time! My favourite toy as an adult is a kid was......the playhouse my mum and dad made for me with two pieces of plywood, some hinges and spare fabric for the curtains my iphone! The movie I have watched enjoyed the most in 2009 was is......kramer vs kramer, and I cried every time Le scaphandre et le papillon and yes I cried! And how would the photo be different?.......I certainly don't need to wear a beanie to work anymore! I would love to know what your answers are so just copy and paste!